مرتضی‌نژاد, غلام‌رضا, رحیمی, حبیب. (1397). ساختار پوسته‌ شمال‌غرب ایران با استفاده از توموگرافی منحنی پاشش امواج لاو. 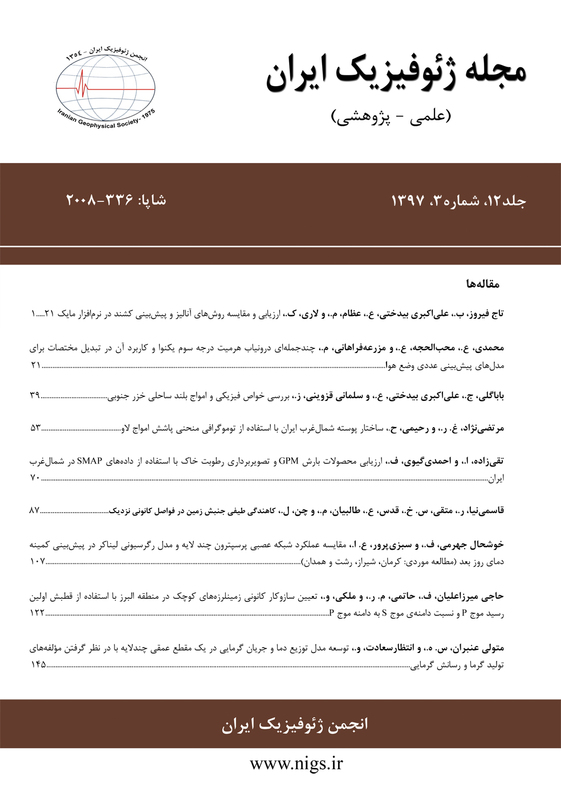 مجله ژئوفیزیک ایران, 12(3), 53-69. غلام‌رضا مرتضی‌نژاد; حبیب رحیمی. "ساختار پوسته‌ شمال‌غرب ایران با استفاده از توموگرافی منحنی پاشش امواج لاو". مجله ژئوفیزیک ایران, 12, 3, 1397, 53-69. مرتضی‌نژاد, غلام‌رضا, رحیمی, حبیب. (1397). 'ساختار پوسته‌ شمال‌غرب ایران با استفاده از توموگرافی منحنی پاشش امواج لاو', مجله ژئوفیزیک ایران, 12(3), pp. 53-69. مرتضی‌نژاد, غلام‌رضا, رحیمی, حبیب. ساختار پوسته‌ شمال‌غرب ایران با استفاده از توموگرافی منحنی پاشش امواج لاو. مجله ژئوفیزیک ایران, 1397; 12(3): 53-69. برای به‌دست‌آوردن توزیع سرعت گروه امواج لاو در شمال‌غرب ایران و نواحی اطراف آن در دوره‌های تناوب 7، 10، 20 و 25 ثانیه، از شکل‌موج 241 زلزله‌ محلی و منطقه‌ای در توموگرافی سرعت گروه منحنی پاشش امواج لاو استفاده شد. نتایج این بررسی نشان می‌دهد ساختار پوسته در حوضه‌ خزرجنوبی و ناحیه‌ فروافتاده کورا تقریباً یکسان است اما با پوسته شمال‌غرب‌ ایران تفاوت چشمگیری دارد. ناهنجاری‌های کم‌سرعت در دوره‌های تناوب کمتر از 10 ثانیه، در رسوبات ضخیم و کم‌سرعت حوضه خزرجنوبی مشاهده شد. در دوره‌های تناوب کمتر از 25 ثانیه، برای Aمجموعه به‌هم‌پیوسته شرق آناتولی@ که فعالیت‌های آتشفشانی بسیار بیشتری نسبت به سایر مناطق دارد، سرعت کمتری نسبت به دیگر مناطق مطالعه شده به‌دست‌آمد. نتایج نشان می‌دهد که ساختار پوسته در سه ناحیه تکتونیکی اصلی رشته کوه­های زاگرس با یکدیگر متفاوت است. در دوره‌های تناوب کمتر از 25 ثانیه، پوسته بالایی خرد شده و فعال Aزاگرس رورانده و چین‌خورده@ - که همراه با گسل‌های معکوس و رورانده فعال و کم‌عمق و نرخ لرزه­خیزی زیاد در این ناحیه است - به‌صورت یک بی‌هنجاری کم­سرعت مشاهده می­شود که مرزی واضح با بی‌هنجاری پُرسرعت در ناحیه Aسنندج‌- سیرجان@ دارد. نتایج این تحقیق نشان می‌دهد ساختار پوسته در شمال‌غرب‌ ایران تقریباً یکنواخت و با کمترین تغییرات است و با ساختار پوسته در نواحی حوضه خزرجنوبی، شرق ترکیه و کوه‌های زاگرس کاملاً متفاوت است. To obtain the distribution of the Love wave group velocities in northwest Iran and its surrounding areas for 7, 10, 20 and 25 second periods, the waveform of 241 local and regional events used in a dispersion curve tomography of the Love waves. The evnets occurred within NW Iran and surrounding areas between 2005 and 2015 and were recorded by 39 permanent and temporary medium and broad band seismic stations belonging to national and international seismic networks. In order to reduce the effect of non-uniform distribution of events, we selected the more uniform list of events out of an initial number of 1734 non-uniform distributed events. We applied the Frequency-Time Analysis method to each event-station path for estimation of Love wave group velocities, then we used a tomographic method to compute the distribution of local group velocities throughout the region. From the analysis of the surface wave tomography, we concluded that crustal structure in the South Caspian Basin and the Kura Depression is almost the same, but it is significantly different from that of the northwest Iran. In the presence of thick and low shear velocity sediments in the South Caspian Basin, we observed low velocity anomalies at periods less than 10 seconds that are surrounded by relatively higher velocities along Alborz, Talesh and Lesser Caucasus. In the “Eastern Anatolian Accretionary Complex” where volcanic activities are much higher than in rest of the region, less group velocities were observed for periods less than 25 seconds. The main reason for this observation can be related to the presence of partial melting zones inside the crust as a result of intensive volcanic activities in this region. In Zagros, for the periods of 7 and 10 seconds, a relatively high velocity anomaly along the “Sanandaj-Sirjan” metamorphic zone was observed, which was trapped by two low velocities along the “Zagros Folding and Thrust Belt” in one side and “Urmieh-Dokhtar Magmatic Arc” in another side. The active and broken crust, reverse, active and shallow thrust faults and high seismicity of Zagros Folding and Thrust Belt is characterized by low group velocities in our results for periods of less than 25 seconds. In most areas of central Iran and Urmieh-Dokhtar Magmatic Arc, local sedimentary basins are characterized by low velocities for periods of 7 and 10 seconds. Our results indicate that crustal structure in the northwest of Iran is almost uniform and has the minimum changes, but it is completely different from the crustal structure in the South Caspian Basin, eastern Turkey, and the Zagros mountains. Alavi, M., 1994, Tectonics of the Zagros orogenic belt of Iran: new data and interpretation: Tectonophysics, 229, 211-238. Al-Lazki, A., Sandvol, E., Seber, D., Barazangi, M., and Turkelli, N., 2003, Pn tomographic imaging of mantle lid velocity and anisotropy at the junction of the Arabian, Eurasian and African Plates: Geophysical Research Letters, 30(24), doi: 10.1029/2003GL017391. Al-Lazki, A. I., Sandvol, E., Seber, D., Barazangi, M., Turkelli, N., and Mohamad, R., 2004, Pn tomographic imaging of mantle lid velocity and anisotropy at the junction of the Arabian, Eurasian and African plates: Geophysical Journal International, 158, 1024–1040.Asudeh, I., 1982, Seismic structure of Iran from surface and body wave data: Geophysical Journal of Royal Astronomical Society, 71, 715–730. Aydin, I., Karat, H. I. and Kocak, A., 2005, Curie-point depth map of Turkey: Geophysical Journal International, 162, 633–640. Berberian, M., 1983, The southern Caspian: a compressional depression floored by a trapped, modified oceanic crust: Canadian Journal of Earth Sciences, 20, 163–183. Brunet, M. F., Korotaev, M. V., Ershov, A. V., and Nikishin, A. M, 2003, The South Caspian Basin: a review of its evolution from subsidence modeling: Sedimentary Geology, 156, 119–148. Dehghani, G. A., and Makris, J., 1984, The Gravity field and crustal structure of Iran: Neues Jahrbuch fur Geologie und Palaontologie-Abhandlungen, 168, 215–229. Didem Cambaz, M., and Karabulut, H., 2010, Love-wave group velocity maps of Turkey and surrounding regions: Geophysical Journal International, 181, 502-520, doi: 10.1111/j.1365-246X.2010.04516.x. Ditmar, P. G., and Yanovskaya, T. B., 1987, A generalization of the Backus–Gilbert method for estimation of lateral variations of surface wave velocity: Izvestiya, Physics of the Solid Earth, 23(6), 470–477. Giese, P., Makris, J., Akashe, B., Rower, P., Letz, H., and Mostaanpour, M., 1984, The crustal structure in Southern Iran derived from seismic explosion data: Neues Jahrbuch fur Geologie und Palaontologie-Abhandlungen, 168, 230-243. Herrmann, R. B., and Ammon, C. J., 2004, Surface waves, receiver functions and crustal structure: in Computer Programs in Seismology, Version 3.30, Saint Louis University, http://www.eas.slu.edu/People/RBHerrmann/CPS330.html. Hessami, K., Jamali, F., and Tabassi, H., 2003, Major Active Faults of Iran, Edition 2003, International Institute of Earthquake Engineering and Seismology, Tehran. Jackson, J. A., and Fitch, T., 1981, Basement faulting and the focal depths of the larger earthquakes in the Zagros Mountains (Iran): Geophyscal Journal of Royal Astronomical Society, 64, 561–586. Jackson, J. A., Priestley, K., Allen, M., and Berberian, M., 2002, Active tectonics of the South Caspian Basin: Geophysical Journal International, 148(2), 214–245. Keskin, M., Pearce, J. A., and Mitchell, J. G., 1998, Volcano-stratigraphy and geochemistry of collision-related volcanism on the Erzurum-Kars Plateau, North Eastern Turkey: Journal of Volcanology and Geothermal Research, 85, 355–404. Keskin, M., 2003, Magma generation by slab steepening and breakoff beneath a subduction accretion complex: An alternative model for collision-related volcanism in Eastern Anatolia, Turkey: Geophysical Research Letters, 30(24), doi: 10.1029/2003GL018019. Levshin, A. L., Ratnikova, L. I., and Berger, J., 1992, Peculiarities of surface wave propagation across central Eurasia: Bulltin of Seismological Society of America, 82, 2464–2493. Levshin, A. L., Ratnikova, L. I., and Berteussen, K. A., 1972, On a frequency–time analysis of oscillations: Annals of Geophysics, 28, 211–218. Maggi, A., Jackson, J. A., Priestley, K., and Baker, C., 2000, A re-assessment of focal depth distributions in southern Iran, the Tien Shan and northern India: do earthquakes really occur in the continental mantle? : Geophysical Journal International, 143, 629–661. Maheri-Peyrov, M., Ghods, A., Abbasi, M., Bergman, E., and Sobouti, F., 2016, ML shear wave velocity tomography for the Iranian Plateau: Geophysical Journal International,205, 179–191, doi: 10.1093/gji/ggv504. Mangino, S., and Priestley, K., 1998, The crustal structure of the southern Caspian region: Geophysical Journal International, 133, 630–648. Mortezanejad, G., Aziz Zanjani, A., Ghods, A., and Sobouti, F., 2013, Insights into the crustal structure and the seismotectonics of the Talesh region using the local and teleseismic data: Geosciences, 88(2), 38–47. Sengor, A. M. C., 1990, A new model for the late Paleozoic–Mesozoic tectonic evolution of Iran and implications for Oman. The Geology and Tectonics of the Oman region: Geological Society, London, Special Publications, 49, 797–831. Sengor, A. M. C., Ozeren, S., Zor, E., and Genc, T., 2003, East Anatolian high plateau as a mantle-supported, N-S shortened domal structure: Geophysical Research Letters, 30(24), 8045, doi: 10.1029/2003GL017858. Stocklin, J., 1968, Structural history and tectonics of Iran: A review: The American Associationof Petroleum Geologists Bulletin, 52, 1229-1258. Taghizadeh-Farahmand, F., Sodoudi, F., Afsari, N., and Ghassemi, M. R., 2010, Lithospheric structure of NW Iran from P and S receiver functions: Journal of Seismology, 14(4), 823–836. Talebian, M., and Jackson, J. A., 2004, A reappraisal of earthquake focal mechanisms and active shortening in the Zagros mountains of Iran: Geophysical Journal International, 156, 506–526. Yanovskaya, T. B., 1997, Resolution estimation in the problems of seismic ray tomography: Izvestiya, Physics of the Solid Earth, 33(9), 762–765. Yanovskaya, T. B., Kizima, E. S., and Antomova, L. M., 1998, Structure of the crust in the Black Sea and adjoining regions from surface wave data: Journal of Seismology, 2, 303–316. Yilmaz, Y., 1990, Comparison of young volcanic associations of western and eastern Anatolia formed under a compressional regime: A review: Journal of Volcanology and Geothermal Research, 44, 69–87. Zanjani, A. A., Ghods, A., Sobouti, F., Bergman, E., Mortezanejad, G., Priestley, K., Madanipour, S., and Rezaeian, M., 2013, Seismicity in the western coast of the South Caspian Basin and the Talesh mountains: Geophysical Journal International, 195(2), 799–814. Zor, E., Sandvol, E., Gorbuz, C., Turkelli, N., Seber, D., and Barazangi, M., 2003, The crustal structure of the East Anatolian plateau (Turkey) from receiver functions: Geophysical Research Letters, 30(24), 8044, doi: 10.1029/2003GL018192.